Description: Old grain elevator at RB Junction. Description: An interesting B30-7/GP40-2/U36B/Slug/GP39 lash up on train R453. CSXT 5579 was originally C&O 8297. Date of photo approximate. Description: CSX B30-7 leading the local train into the Manchester CSX yard. Description: CSX #5579 approaches Cartersville Station. Description: Closer View of CSX #5579 approaching Cartersville station. Description: Southbound CSX #5579 approaches the station at Cartersville, Georgia. 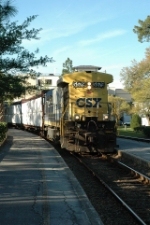 Description: The CSX Taft local rolls through downtown Winter Park. Description: Yes, 5542 is that badly faded! Nice consist working Taft Yard. Description: A776, A798, N151 & A779 at the south end of Taft Yard. Description: Pulling loaded racks from the service track extention into the siding in order to back up into Taft Ramp. Reportedly, this daily scene will end when the upcoming operations in Winter Haven open up. Description: These probably won't see these out on the road for CSX again.